This is a story with a happy ending, but it starts some fifteen years ago as I write. 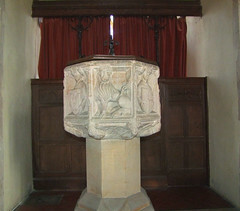 One hot afternoon in the summer of 1999, I set off from Halesworth railway station on my bike, and took a mazy, stopping route around the churches of Spexhall, Wissett, Chediston and Linstead. As I travelled, the villages got smaller, the lanes narrower and lonelier. And, at last, I came to Cookley - the church, and a few houses, for that was all there was. A hamlet really, with outlying smaller settlements scattered over its wide parish. St Michael is the only building of note, and is rather oddly set, because it is in someone's back garden. It is separated from the village street by several houses, and it is necessary to walk through the garden of one of the houses to reach the church. Elsewhere in Suffolk something similar exists at Chelsworth and Falkenham, but they, at least, have driveways from the road. Here, you really do have to walk up the garden path, past the washing line and front door, to reach the church gate. This must make weddings and funerals interesting. Of course, St Michael's situation is just a survival of what many villages were like, in the days before public highways and tarmac roads. In 1999, I found Cookley church locked. There was a keyholder notice, but it was rather oddly worded. It made it perfectly clear to visitors that no unaccompanied access would be granted, and that furthermore the key was only available between the hours of 10-12 and 2-4. Incidentally, you might think from this that the church must be a very interesting church, full of treasures to feast upon. But, of course, that is not so. Only the dullest churches are guarded so pedantically and tenaciously. I looked at my watch and saw that it was ten to two. Surely that was close enough to the appointed time? An elderly gentleman opened the door, acknowledged my request, and told me I'd have to wait ten minutes. he went back inside. Funnily enough, this reassured me that in this quiet, remote part of East Anglia there were still people who kept to the old ways, or were at least eccentric enough to be interesting. On the dot of two he came out with the key, and led the way up to the church. 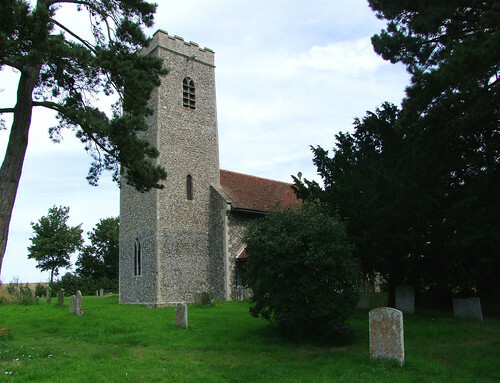 That visit formed the background to the first entry for this church on the Suffolk Churches Site. A few days after my visit, I wrote: So, what is it like, this Fort Knox in a garden? Well, it simply is one of the worst 19th century restorations in Suffolk. What can they have been thinking of? As late as 1893, this church was effectively gutted, stripped mercilessly of all the accretions of age, including an entire 15th century rood screen. 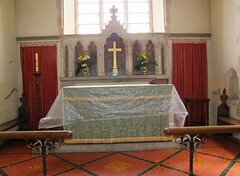 The Stuart pulpit was thrown on a heap, to be rescued by the good people of Chediston, who use it to this day. 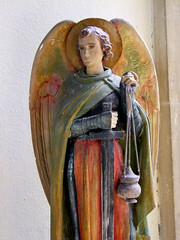 St Michael was forced into the anonymous strait-jacket of luke-warm ritualism; clinically neat and trim, but very dull. The vicar of the time had formerly been at Flixton St Mary, but found himself here without the money to achieve anything as dramatic, which may explain a lot. It is all a bit awful, I'm afraid. Of course, I couldn't say as much to my guide. But between us, we did find two things that would make a visit very worthwhile. He showed one to me, and I showed one to him. There is not much to it; more carpentry than art. 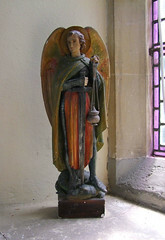 "We really ought to find a better home for that", said my companion, although it was not clear if he meant back to its original place in the rood screen, or out on the compost heap with the dead flowers. However, as it has been leaning up against this wall for nearly 70 years, I did not fear for its safety. An ancient, typewritten slip of paper telling how it was found was sellotaped to it, but it fell off when I lifted the upright to feel its weight. I pressed the label back on, but it has probably fallen off again by now, and been swept up by some enthusiastic cleaner, I shouldn't wonder. It occured to me later that Cautley had probably typed it out himself. The tower, which is mainly 13th century, is badly in need of repair; they daren't ring the bells now. On leaving, I felt I ought to make a contribution. However, all I could find in my pocket was a 50p piece. "Well, every little helps", I mumbled, putting it on the table, but my guide seemed inordinately grateful, and waved me cheerfully off in the direction of Huntingfield. What a nice man. I came back in 2007. As I had done eight years previously, I turned off of the Linstead to Huntingfield road along a narrow lane which dipped and doglegged around what must have been ancient field boundaries, the valleys enough to hide any view of the road behind or ahead. But I needn't have worried; as before, I did not pass a single car until I was on the outskirts of Walpole half an hour later. I was reminded that Cookley was not a grand settlement. 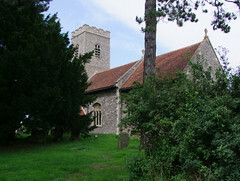 Rather, a cluster of small cottages, some of which were obviously former council houses, surround the church on its rise. Scotch pines in the graveyard were acolytes to the tower, which appeared to have been repaired since I was last here. There was no one about. I hauled my bike off the road onto the grass verge, but stopped myself just in time, because this was when I noticed the vast amount of dog mess on the verge. Living in a town, I am so unused to seeing this kind of thing nowadays, and so it seemed particularly disgusting. Picking my way through it, I opened the cottage garden gate, and walked up to the churchyard. As I passed the cottage, a slavering alsatian barked threateningly at me through a glass door. Well, the church was locked. And this time, there wasn't even a keyholder notice. The outer gates were padlocked with a heavy duty chain. I thought to myself what a message this sent to the People of God about how the Church in Cookley perceived its mission. I decided to go and try the cottage where I had got the key before. This was down on the village street, a few doors up. Picking my way carefully along the verge, I found the kind old man who had shown me around in 1999. He was just getting out of his car. When I asked about a key, he shook his head thoughtfully. It seemed that his wife had now retired as the churchwarden. He really had no idea where a key might be now. "we had the key for years, you know", he said sadly, as if this might help. I went back up to the churchyard to get my bike. The whole graveyard was full of the smell of chip fat from one of the adjacent houses. I thought about knocking on the cottage door as I passed back through the garden, but the large, salivating dog threw itself at the glass as I approached, as if daring me to do so. And so I didn't. If the key had been there, then I'm sure there would have been a notice, or that the nice man would have known. And if the key was there, then I clearly wasn't welcome to it. Instead, I got back on my bike, and thought to myself sadly that, if I came back this way in another eight years, it was quite likely that I would find the church no longer in use. After I'd updated the entry I had several e-mails from people relating similar experiences, including one from a man who had been born and brought up in Cookley and was appalled by the state it was in now. A few years went by, andd then one day I had an e-mail from a nice lady telling me about great changes at Cookley. The people with the alsatian were gone, the church was being looked after carefully, and furthermore it was now open every day. So, would I please come back and have a look? And thus one morning in late July 2014 I went back to Cookley. I set off from Halesworth as before, but this time diverted to Blythburgh church first, where I spent a pleasant hour photographing everything that didn't move, before cutting westwards to Cookley. The sun shone on my back as I raced through the lanes that joined Blythburgh to Wenhaston to Bramfield and eventually to Cookley, arriving from a different direction to my two previous visits. And other things were different - the verge was spick and span, the cottage in front of the church was obviously in new hands, its garden full of flowers. And I walked up to the church to find it open. I stepped inside to a delightfully well-kept interior. I was struck for the first time by how simple the 19th Century restoration was here, a lack of grandeur that suited a small rural church, and one in which the blacksmith and ploughman would have felt quite at home. What I had said about it in 1999 was wrong, and I was sorry. 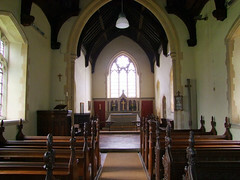 Furthermore, the interior feels loved now - everything is clean and tidy, and Cautley's rood screen upright has been bolted into its correct position beside the chancel arch, although I was disappointed to discover that the typewritten note has now gone, and partly blame myself for this. And of course the Norman north doorway is still as fine as ever. 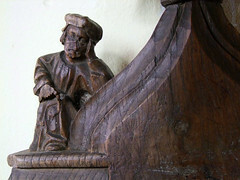 Two little bench ends survive from the 15th Century - had I noticed them before and forgotten them? One shows a peasant seated and praying with his rosary beads. He supports his head with one hand - is he bored? If so, this could well be Pride, the last survivor of a Seven Deadly Sins set. 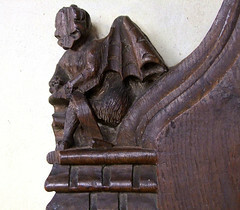 The other appears to show a devil, but I think it is actually an angel holding a prayer scroll. 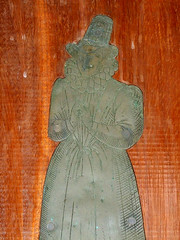 There is also a double figure brass from about 1600, now unfortunately remounted on the wall. This is a lovely church. This needs saying, because it has had a bad press over the last few years, and by no means just from me. 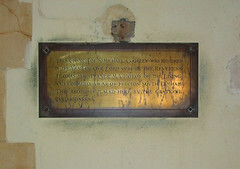 But it has survived, and now prospers, and is well deserved of our visits, prayers and even donations - did they ever get those bells ringing again, I wonder?